Have an AK-47 or SKS? 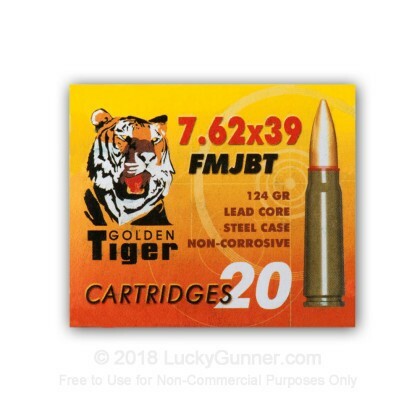 Then you need this Golden Tiger ammo! This is new production and made to Russian mil-spec. 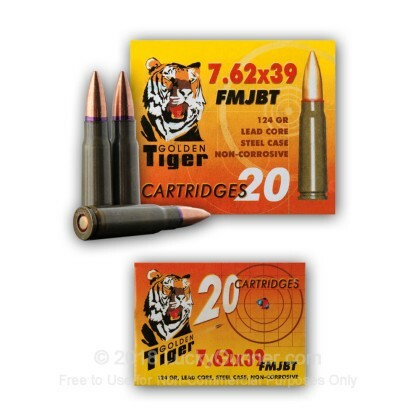 This is quality, affordable ammo with a long shelf-life! 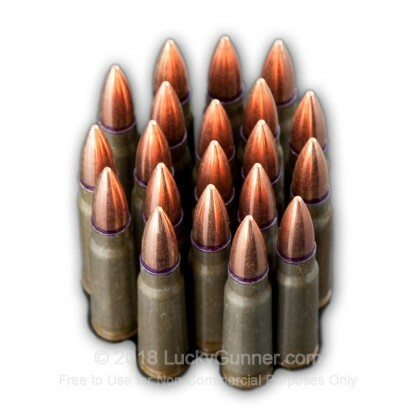 This ammo has a lead core, is non-corrosive, and has a full-metal jacket boat-tail bullet for maximum stability during flight and penetration upon impact! 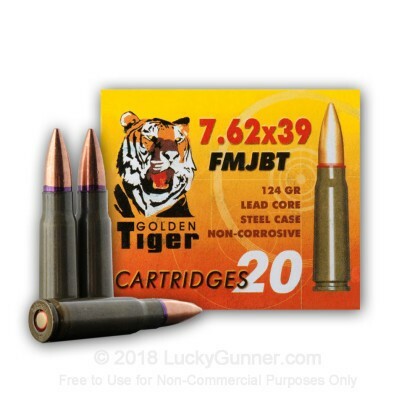 It comes in a sealed packs containing 500 rounds each which will help keep moisture out of the ammo increasing its shelf life! I've only shot a couple hundred rounds so far, but I had zero issues with feeding or ejecting and it seemed fairly accurate at 100 yards. The price is definately right and it isn't as dirty as others I've used. 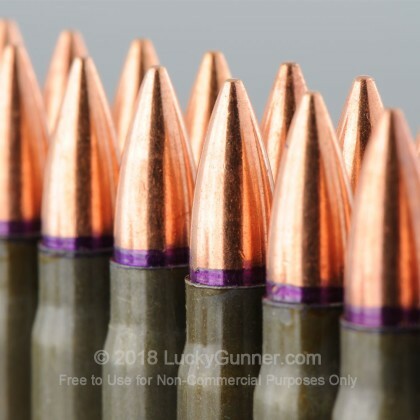 Overall I consider this good ammo for a Saturday trip to the range or for plinking but would move up the ladder if I knew my life depended on it. Fast no hassle ordering, fast shipping, excellent pricing...LuckyGunner RULES! The Golden Tiger is still lacquer coated which makes for better long term storage and easier cleanup. A little harder to get than Wolf but well worth the effort. I got a couple of boxes at a gun show,tried it in my S.K.S., the groups at 100&200 yrds. surprised me! 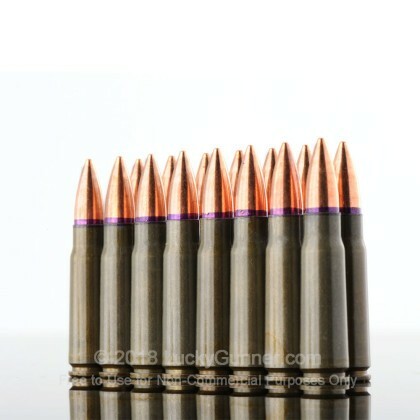 It is the best ammo for this rifle I have found to date!! 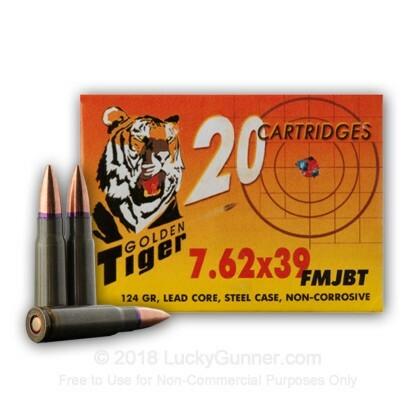 dependable, accurate, and the price of Tiger @ Luck Gunner with the quick shipping is superb!! Thank You! Have run the Tiger thru my Saiga 7.62 & found it to be relatively clean, accurate with the FMJBT, and solid pricing. After 300 rounds, just one cleaning, my ak loves it--and so do I. Quick and easy checkout great value and fast delivery im talking next day delivery for my location wow !!! .Best value and laquer finish too! Laquered cases always seem to perform better in Ak's and Golden Tiger is no exception. I'd avoid the poly coated ammo- too messy! Great product in mint condition, shipped very fast. Tiger beats Wolf.